As Spring comes up, so does the galactic arm of the milky way. Due to the curvature and constant movement of the earth, the Milky Way is below the horizon during the months of November to February, and can be enjoyed with the galactic center from March to October (if you live in the northern hemisphere). 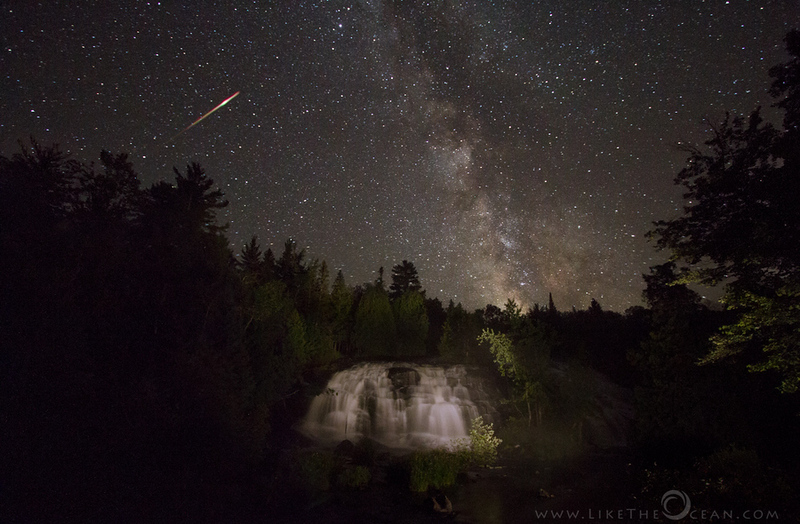 This shot is from the one of the most known Perseids meteor shower from the past year. We drove around the Green river state wildlife area and luckily chanced upon a remote road. 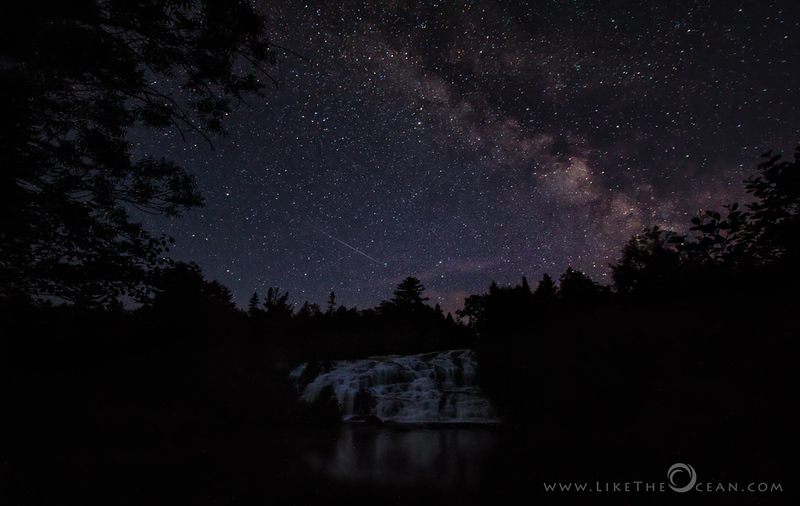 As I light painted the foreground with Coast HP7, the meteor sparkled across the night sky. One of the stars even decided to play the head of the comet. The Perseid meteor shower, is associated with the comet Swift-Tuttle and appears to streak out of Perseus constellation. 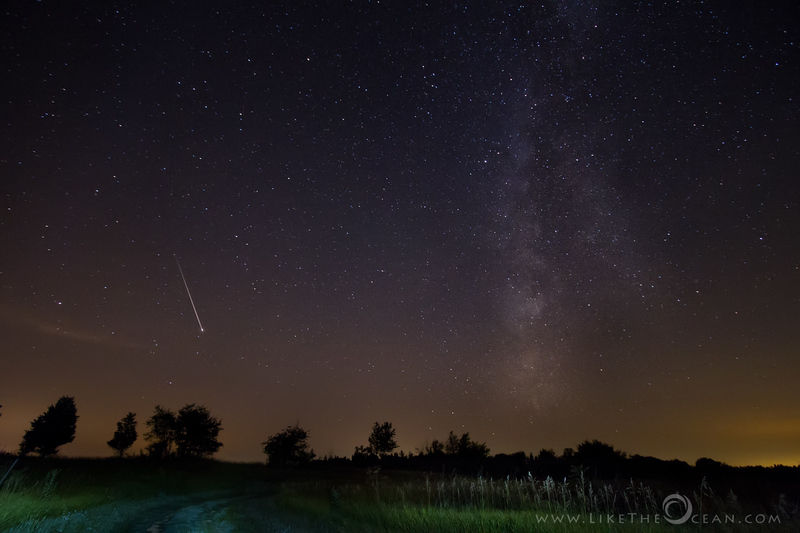 Perseids usually is visible around 2nd week of Aug. With little or no moon to ruin the show, this was a great year for watching the Perseid meteor shower. Every time the comet dives in towards the sun, it leaves a trail of rocky icy bits along its path like a cosmic, frozen Hansel and Gretel trail. This trail can remain intact for decades after the fact and gets refreshed with each new pass (the last of which was in 1992 and the next one is 2126). As the Earth barrels through the debris field, all the little bits in it’s way burn up in the atmosphere, creating brilliant streaks across the sky. Even particles the size of the sand can create some lovely views like this. – adorned by a shooting star ! Sleeping under the stars is an experience unto itself. Add a streak of shooting star and it becomes magical. Perseids meteor shower is one of the consistent ones. Capturing it west coast last year was fun and exhilarating. Equipped with the past experience and learning had been scouting locations and planning for it this year. Unfortunately the weather was not playing along over this particular weekend. Almost all of Illinois was forecasted for gloomy weather and thunderstorms. As I was debating, there was a forecast for Aurora sighting over this past (same) weekend with a level of 5. Both these together made it too tempting to drop the plan. I decided to take my chances with the weather. After lot of deliberation decided to drive up north to for 8 hours. The plan was to get out during the daylight and scout the location as much as possible. Thought it would make it easier to maneuver again during the night, but boy oh boy, could I be any more wrong !!! The pitch black unknown trails were kind of eerie. 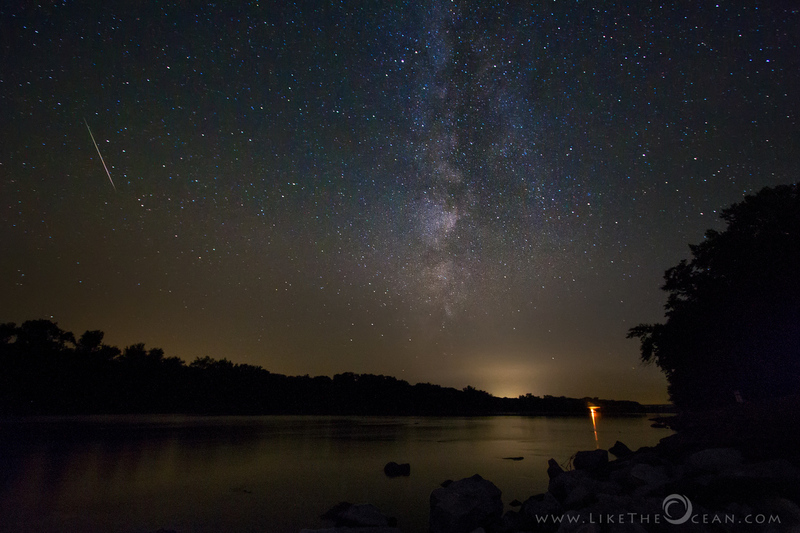 But once the stars came out it was a totally different world – so serene and tranquil. Definitely a moment of serenity and one I would cherish ! 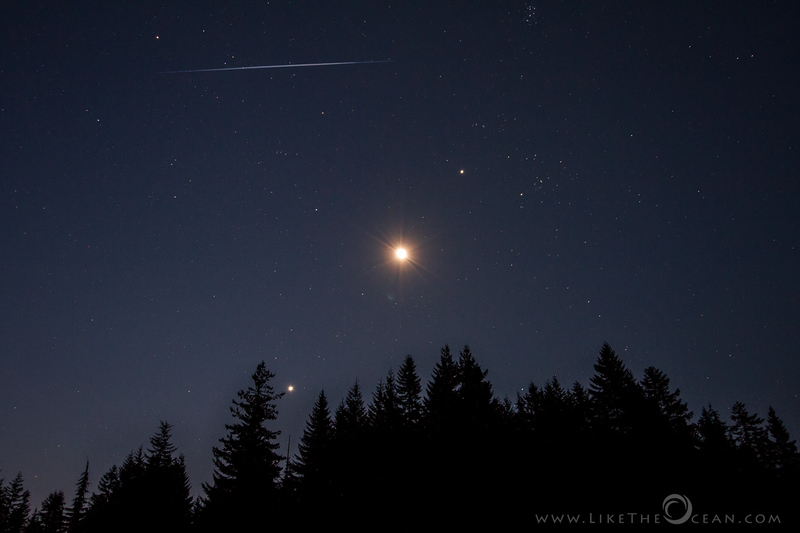 Shooting Star(s) & the Moon, Venus, Jupiter etc. Sleeping under the stars is an experience unto itself. In addition, being away from the city lights takes on a whole new level of fun, when you start taking star pictures. 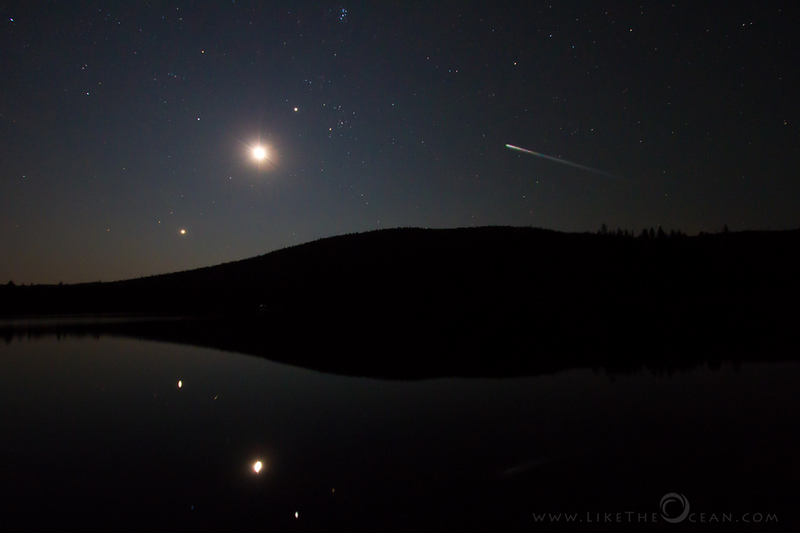 If u have not done it before, definitely give it a try :) In expectations of capturing a moment of Presides Meteor shower, headed to Trillium lake over last weekend (Aug 11-12, 2012) . Overall the meteor shower was pretty elusive than expected, always managing to put a show where the camera was not pointed. As the night was passing by, was worried that the moon rise (around 1:30 AM) might reduce the possibility of meteor sighting. But I was pretty surprised when everything just lined up just (around 3:30 AM) – the Venus, the Moon and the Jupiter – and even a meteor was adorning the scene. The star cluster you see a little off center on top is Pleiades nebula. Hope u enjoy viewing as much as I did during the shooting !